Multidisciplinary specialists in physics, climatology, mechanics, engineering, architecture and technology (device construction). Italy, Belgium, Greece, Germany, France, Ireland, Romania, Spain and Switzerland – well balanced geographical representation. Cheap-GSHPs aims to reduce installation costs of GSHE’s up to 25-30% and reduction of CO2 emissions of 1.800 T/y. Between February 2019 and April 2019, the EU funded project Cheap-GSHPs is offering – FREE OF CHARGE! – extremely interesting national workshops and training courses! REHAU and FAU will jointly organize a training webinar, for presenting the achievements done in the Cheap-GSHP Project. The webinar will be organized both in German, and in English. The webinar in German will be held on February 1st, 2019, at 10:30 CET. The webinar in English will also be held on February 1st, 2019, at 12:00 CET. The Romanian Geoexchange Society, in partnership with the Faculty of Geology and Geophysics Bucharest and the Romanian Association of Hydro-geologists, will organize a workshop and a training course for specialists on March 4th, 2019, starting at 14:00. SUPSI will organize on the 27th of March a full-day event here in Switzerland, with the collaboration of University of Padova, Galletti Company, energy associations and public administration. The course will be held in Italian and will be targeted both for specialists and non-specialists.. The Cheap-GSHPs Project training course in Spain will be organized jointly by the Universitat Politecnica de Valencia and Tecnalia, and will take place in Valencia, on April 9th, 2019. The University of Padova will organize a training workshop – April 12, 2019. TECNALIA organizes a training course for specialists in Bilbao. 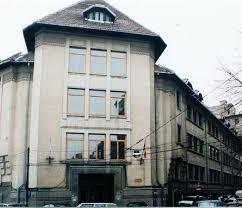 In the frame of the Horizon 2020 Cheap-GSHPs Project, SLR Consulting will organize a NATIONAL WORKSHOP AND TRAINING COURSE on the premises of the Red Cow Moran Hotel on Thursday April 25th from 8.45 to 15.30. GeoGreen Company – partner in the Cheap-GSHPs Project – organizes a training event in Brussels, in the building of Bruxelles Environment, on Friday, April 26th, 2019. 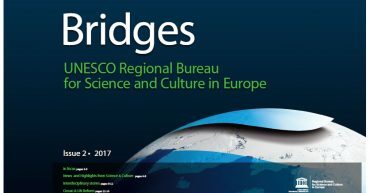 This training event is a joint action with the European Project Brugeo. The lectures will be presented both in French and in Dutch. Please download our project materials. Subscribe now and receive periodically updates with educational materials, new courses, interesting posts, popular books and much more! Check our Social Media pages and find out the latest news about our project. The goal with the DEEPEGS project is to demonstrate the feasibility of enhanced geothermal systems (EGS) for delivering energy from renewable resources in Europe. The DESCRAMBLE project proposes to drill in continental-crust, super-critical geothermal conditions, and to test and demonstrate novel drilling techniques to control gas emissions, the aggressive environment and the high temperature/pressure expected from the deep fluids. DESTRESS is aimed at creating EGS (Enhanced geothermal systems) reservoirs with sufficient permeability, fracture orientation and spacing for economic use of underground heat. The concepts are based on experience in previous projects, on scientific progress and developments in other fields, mainly the oil & gas sector. The increased need for renewable energy sources has led to expansion of shallow geothermal applications for heating and/or cooling of buildings. The integration of heat exchangers in those elements of the structure that interface with the ground, such as foundations, tunnels and diaphragm walls, is particularly attractive because of the inherent cost saving involved in combining a required structural component with the harvesting of geothermal energy. GEMex has the ambition to bring together the extended Mexican know how of discovering, developing, and deploying conventional geothermal energy systems with a variety of European expertise from similar geothermal energy systems (Italy, Iceland etc. ), of developing EGS technology, and finding new approaches to make use of super-hot geothermal systems. GeoPLASMA-CE is an Interreg Central Europe project dealing with different aspects of shallow geothermal use for heating and cooling in both urban and rural regions in Central Europe. In collaboration with geological surveys, universities, non-profit organizations, administrative bodies and private companies, new management strategies for the effective and sustainable use of shallow geothermal will be explored in six different pilot areas in Germany, Czech Republic, Poland, Slovakia, Austria and Slovenia. The project aims at generating web based information system for the visualization of shallow geothermal potential and risk. Moreover, it also intends to create an expert platform to connect experts and stakeholders in the field of shallow geothermal use in Central Europe. The Energy Efficiency Directive sets out measures to achieve further savings in energy supply and use. Indeed buildings represent one of the biggest potential of unused energy savings. 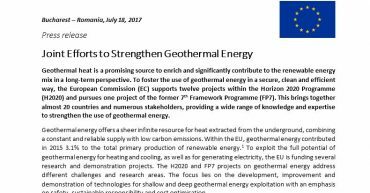 New concepts for high-temperature geothermal well technologies are strongly needed to accelerate the development of geothermal resources for power generation in Europe and worldwide in a cost effective and environmentally friendly way. The GeoWell project will address the major bottlenecks like high investment and maintenance costs by developing innovative materials and designs that are superior to the state of the art concepts. GEOTABS hybrid is an active research project to optimise the pre-design and operation of a hybrid combination of geothermal heat pumps (GEO-HP) and thermally activated building systems (TABS). It will design an improved, automated ‘Model Predictive Control’ (MPC) solution for testing on hybrid supply and emission systems in demonstration buildings such as offices, elderly care homes, schools and apartment blocks. Applying MPC to hybrid GEOTABS optimises the performance and efficiency, making it more economically attractive and increasing take up. The goal of the GreenHP project is to investigate and develop a new highly efficient heating system based on high-capacity air/water heat pumps for retrofitting multi-family houses and commercial buildings with a focus on cities. This high power heat pump system will use an alternative refrigerant and will interact with large (renewable) energy systems, like the smart grid in particular, and will include other renewable energy sources, like photovoltaic and solar thermal, as well as energy storage. IMAGE is a European project involving 20 partners from 9 different countries. Goal of the project is to develop an integrated geothermal exploration approach based on state-of-the-art scientific methods. The project is co-funded for four years by the European Commission within the 7th Framework Programme for Research and Technological Development (FP7) and started on the 1st of November 2013. The project ITER (acronym for Improving Thermal Efficiency of hoRizontal ground heat exchangers) aims to ensure the sustainability of ground coupled heating-cooling systems and especially the horizontal ground heat exchangers systems. In latin “ITER” means “travel” and this word represent the continuous personal and scientific progress related to research activity, focused, in this case, on very shallow geothermal energy topic. The goal of MATChING is the reduction of cooling water demand in the energy sector through innovative technological solutions, to be demonstrated in thermal and geothermal power plants. Within the EC funded Horizon 2020 project SURE the radial water jet drilling (RJD) technology will be investigated and tested as a method to increase inflow into insufficiently producing geothermal wells. The goal of the ThermoDrill project is to develop an innovative drilling system which will enable faster and cost-efficient drilling. Renewable Heating and Cooling European Technology and Innovation Platform The European Technology and Innovation Platform on Renewable Heating and Cooling, aims at playing a decisive role in maximising synergies and strengthening efforts towards research, development and technological innovation which will consolidate Europe’s leading position in the sector.